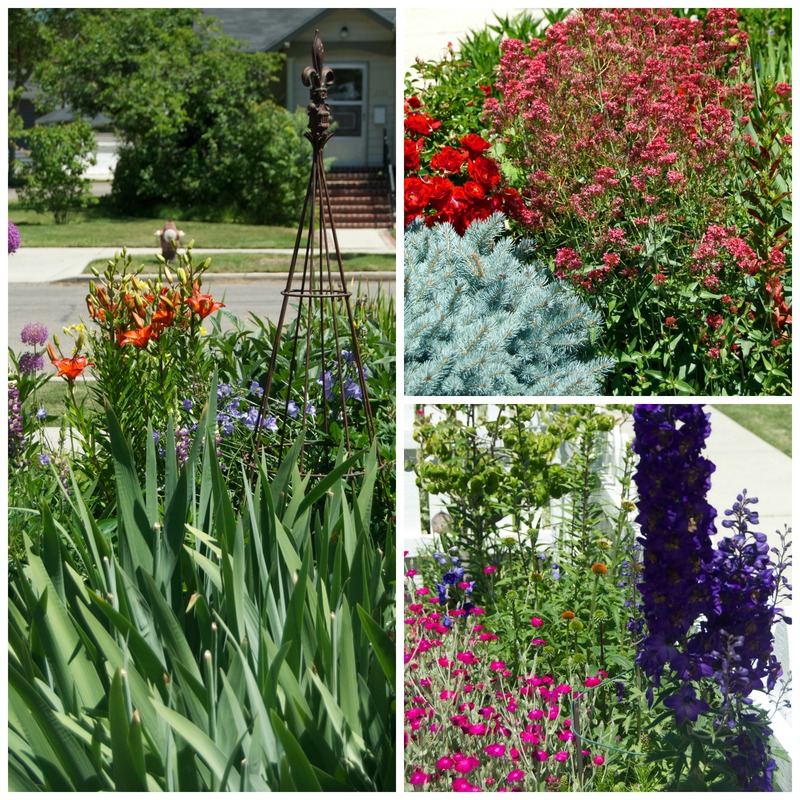 The Boise Garden Tour happened a few days ago. 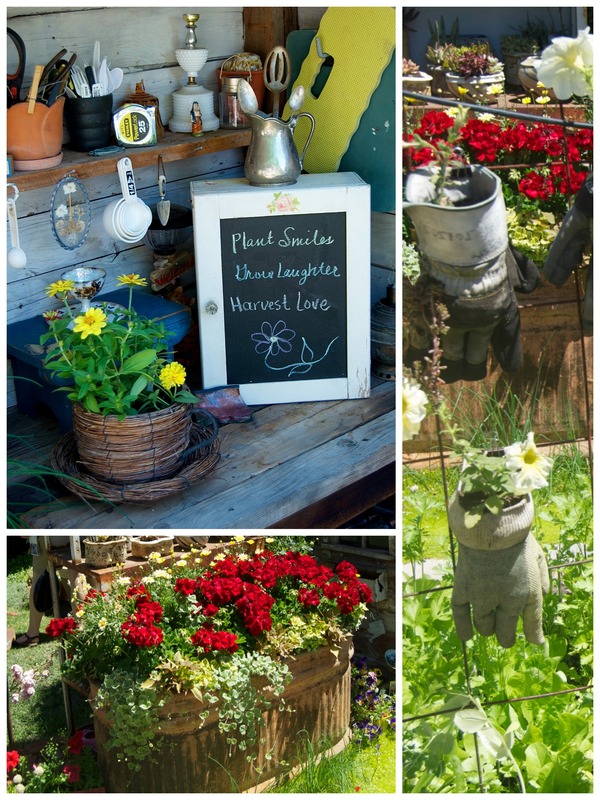 It was a fun day seeing lots of different styles of gardening in our lovely, livable city. 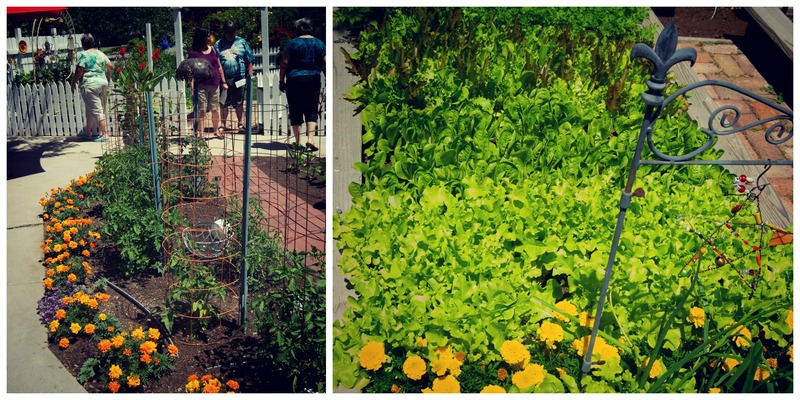 Click to see Garden #1 and Garden #2. Today’s post features the third and fourth gardens on my route. Here is a look at Garden #3. I would describe this garden as quaint and very merry. 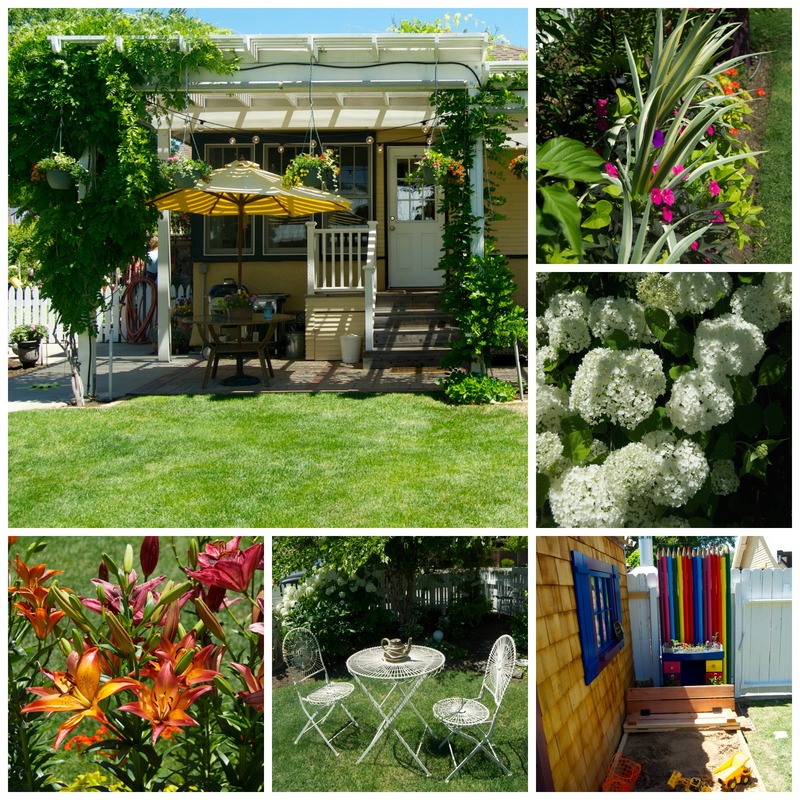 Lots of colorful, classic, cottage-style plants greet passersby from behind a white picket fence in the front garden. Stepping in, one of the first things to catch my eye was this cute stake system. Next, I was drawn into the delightful vegetable plaza that ocated between the front and back gardens. Look at that lettuce! Near the vegetable plaza, I noticed these cute plant/object creations. Looks like lots of fun happens here in the veggie plaza area! Next, I walk into the back garden and see lots of color, along with places to have a seat and a drink! And not just for adults! Check out that cute sand box for kids! I didn’t get a chance to visit with the garden keepers here but I know they are artists. 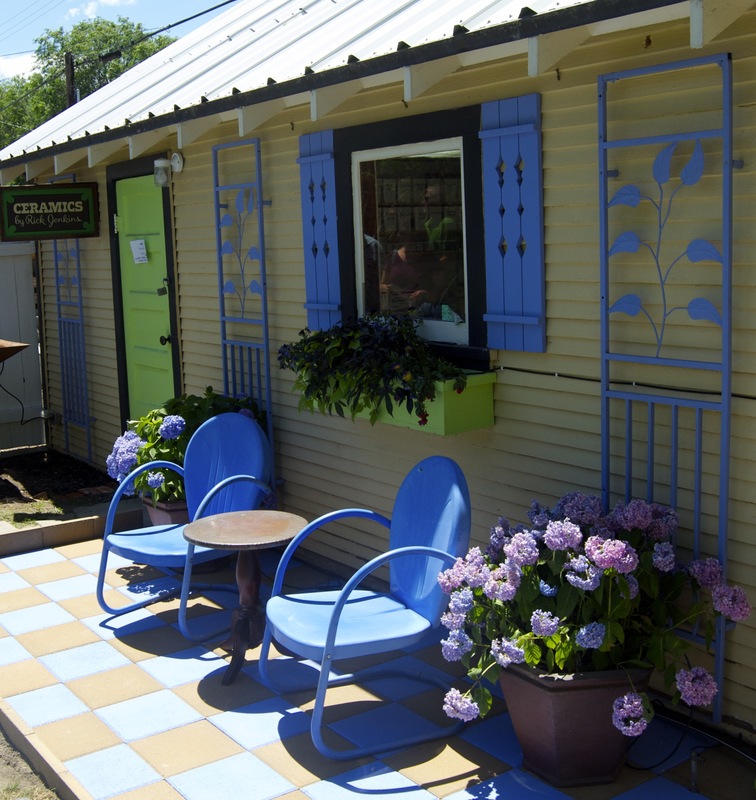 In fact, they have a small pottery studio. Here is a shot of the entrance to the studio. 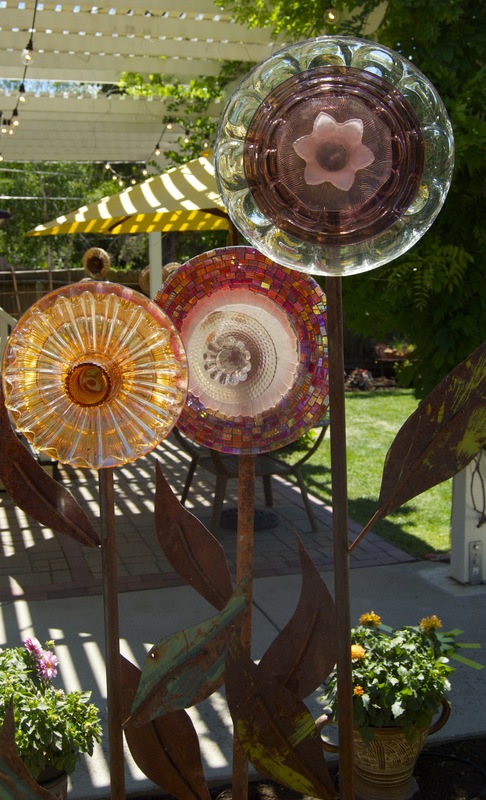 These beautiful glass garden ornaments are also part of their artistry. The colors are exquisite. Ahhh, very nice. I went away with a little extra spring in my step as this garden seems to percolate happiness and good cheer! As we arrived at this little bungalow I noticed how lush green textures seem to hug the front of the residence in such a charming manner. The lavender just ready to bloom looked splendid! 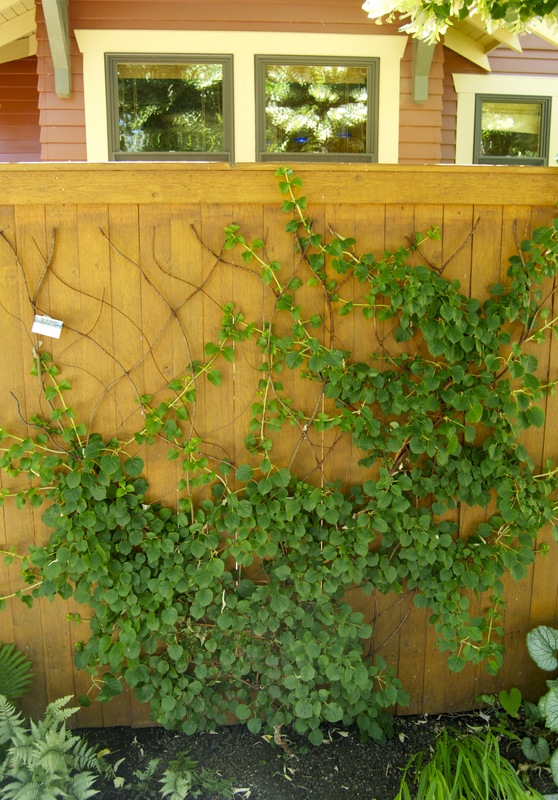 Walking around the front to a gate leading into the backyard, I saw this great custom iron trellis with climbing hydrangeas growing on them. Love the design and scale! Once inside the entrance there is a long narrow bed and a path leading to the back garden. I saw this awesome plant along the way and the garden keeper told me the name but I am unsure I remembered it accurately. I believe it is a type of Hydrangea, maybe ‘Vanilla Strawberry.’ If someone definitely knows this plant, please comment. I would like to know. Once in the back garden I found it so intimate and restorative. 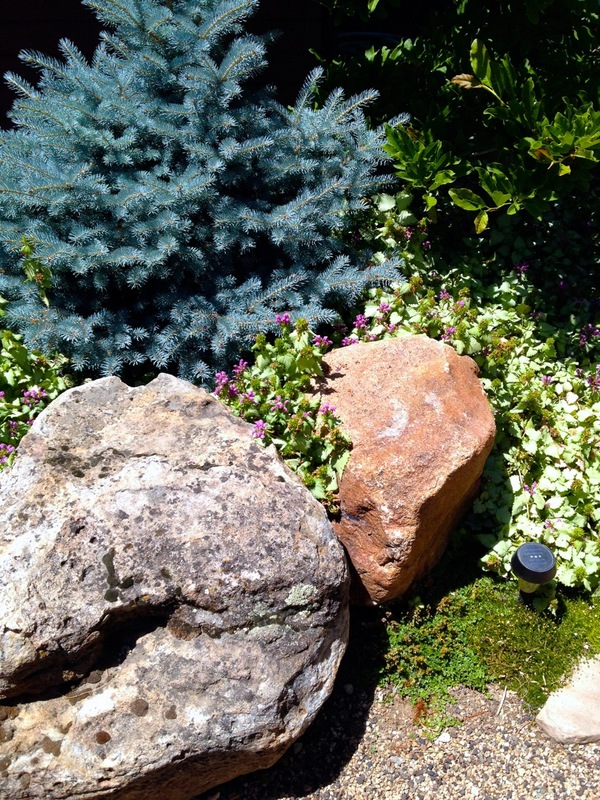 The large boulders designed in a semi-circular pattern combined with the mature-looking plantings exude privacy and beckon one to sit for a bit or awhile. This area has a very natural vibe giving you the feeling of a private peaceful spot in the forest. 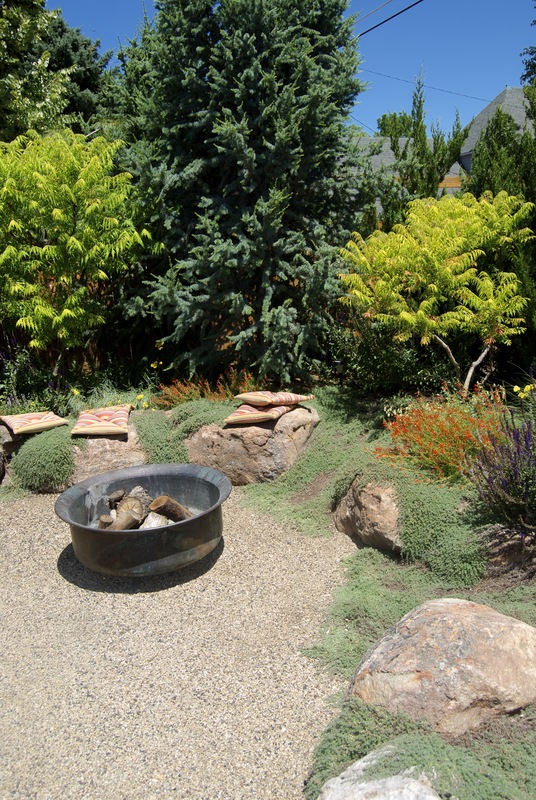 I loved the stone (both large and small) chosen for this area and the unassuming fire pit as well. Walking a bit further I came to a cushy, patio dining area, a gorgeous fountain and some other lush, simple plantings. Notice how even the BBQ is camouflaged by lush green plantings. Love it! I loved this small garden with it’s natural ambiance and intimate mood. 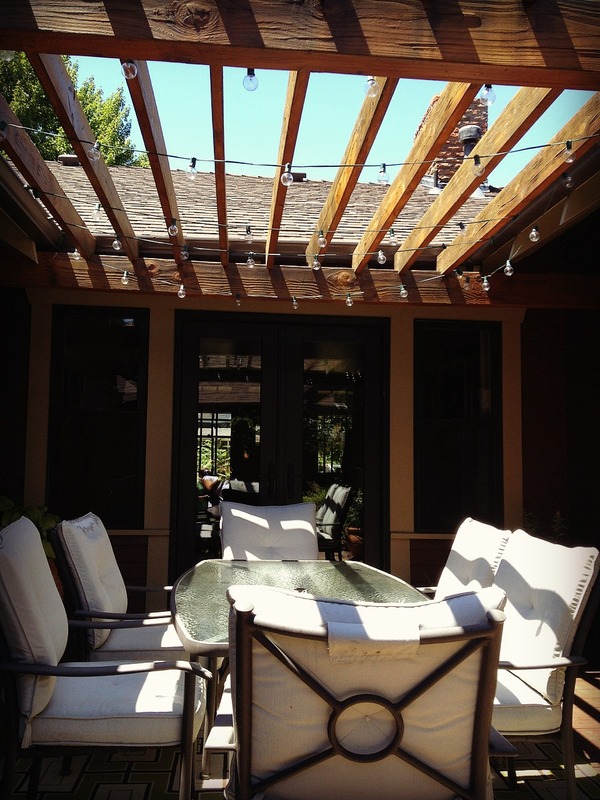 Although it was organic in feel, it was packed with modernities we love to enjoy such as an outdoor eating space, a BBQ, fire pit and even a hot tub. I could have spent a lot more time here but I knew more gardens were waiting. My friend, Kecia Carlson (owner of Madeline George Design Nursery) , worked with the garden keeper/home owner to create this lovely sanctuary. My hat is off to the two of them as I feel it turned out wonderfully rich and a perfect complement to the home. Bravo ladies! How about you? 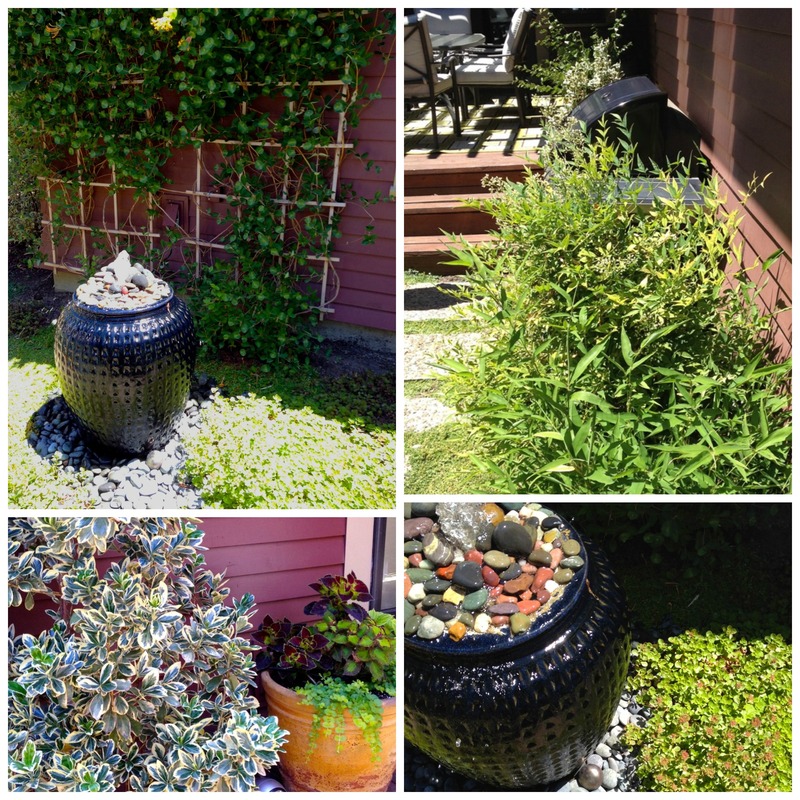 Do you like seeing the diversity of garden style? 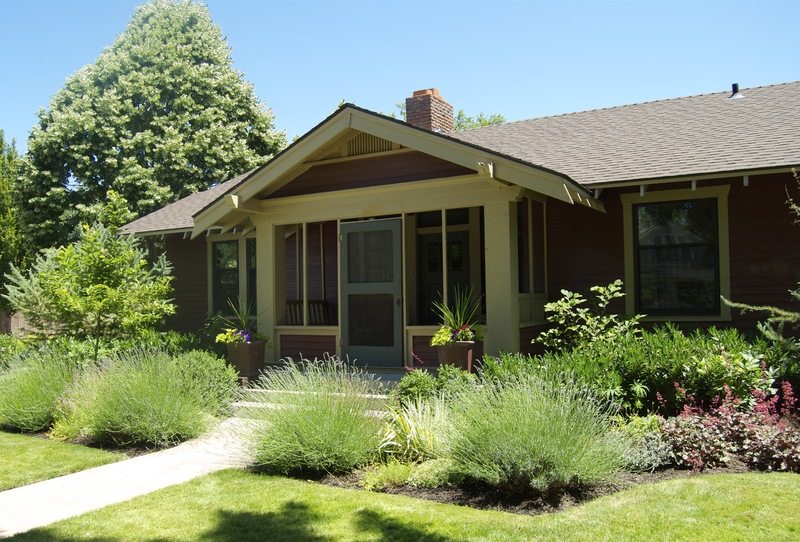 Do you have a specific garden style? Stay tuned for Garden #5 and #6 coming soon. Happy Gardening! I love the artistic creativity and flair of #3 and the calming effect of #4. There are so many wonderfully artistic touches and details in each of these gardens to pull your eye, to think about, and to enjoy. still soaking up so much -have so much to say but no time right now – so I leave for now with the periwinkle blue porch stuck in my head – and enriched form the great shots of what looks like an amazing show!!!! and #4- which felt completely Francais to moi – the lavender and just the way your described it – never saw climbing hydrangeas- and please let us know if someone tells you the name of that plant – but the “Vanilla Strawberry” was one of the prettiest ones for me personally – loved it. Thank you so much for your wonderful comments Y! Thanks for stopping by Michael. Yes, I liked the reused glove too but I imagine it is hard to keep the plant moist when it gets really hot here. Blue spruce grow very well and very big in our area. They are a pretty color. Garden #3, just beautiful, I loved the color combinations….the studio entrance, gorgeous with the rare colors they defined so perfectly!!! Yes, I love that periwinkle blue too with the lovely hydrangeas. Lots of color on this tour. 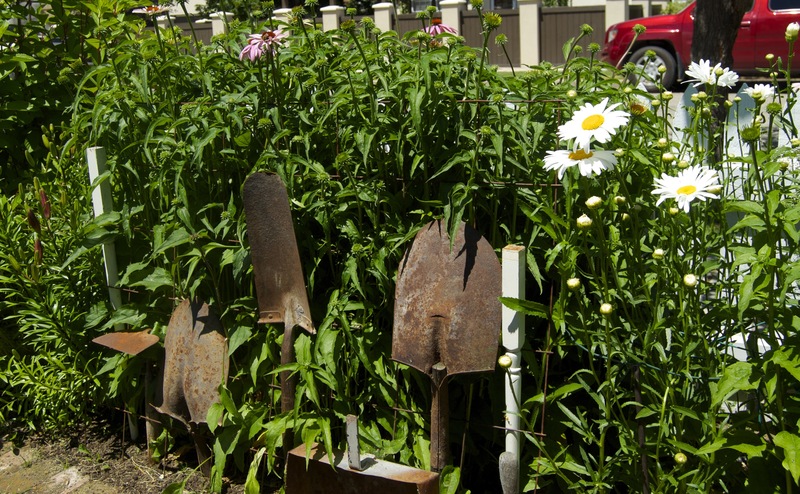 The planted, rusted garden tools are cute. Yes, I thought a good idea as a sort of decorative staking system. I’m glad we got to go on your garden tour with you, it’s so inspiring! I’m pretty sure that pink hydrangea is Hydrangea arborescens. We had them at the nursery and they were always floppy in a pot. Vanilla strawberry is Hydrangea paniculata and has a cone shaped flower. 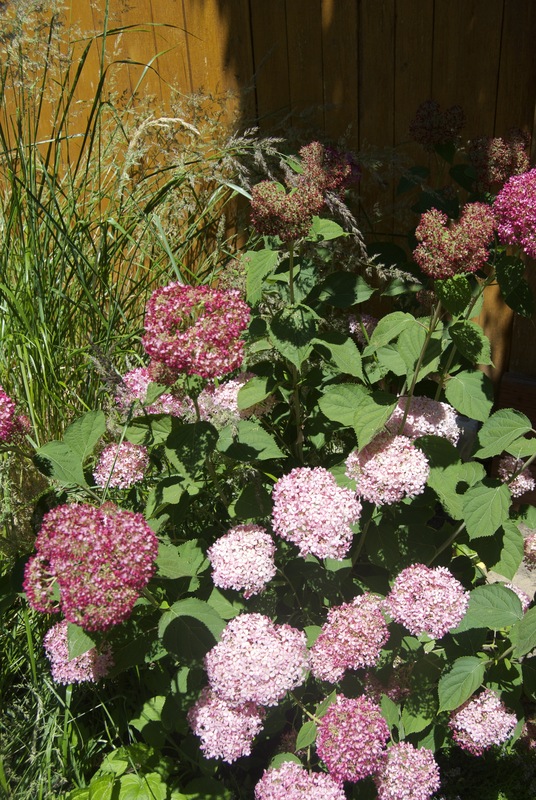 The hydrangea looks like hydrangea arborescens “Invincibelle Spirit” – the first pink flowered version from the same family as the old fashioned hydrangea arborescens “Annabelle” with the large, round, white balls that flop about. In my garden, Invincibelle Spirit flowers are much smaller, flatter, fade to dusty rose, bloom earlier (starting now early July) and continue to bloom all summer. Not as floppy as Annabelle because of the smaller flowers. I love this shrub and the shades of pink – two growing in dappled shade in dry conditions under an Austrian Pine tree. A newer version from the Endless Summer series is arborescens “Bella Anna” – also pink from the get-go and supposed to be sturdier. Three Bella Anna’s are just starting to bloom in my garden – my first year for them so I cannot comment on its studier stems as yet. Strawberry Vanilla is a totally different hydrangea but fabulous and well named, starting white and changing to various shades of pink and strawberry and white all at the same time. It has study red stems so looks good even when not blooming (it blooms much later). Thank you so much for the information and for stopping by! Now I know the plant variety but am also interested in “Bella Anna.” I will take a look at them. I love how they use rusty old tools in garden 3. That’s definitely giving me ideas!